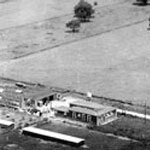 Our clinic was founded in 1922. 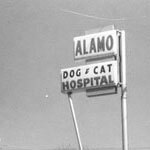 Alamo Dog & Cat Hospital is the oldest small animal veterinary practice in Texas. Dr. U.E. 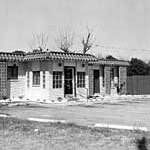 Marney founded the hospital and at that time, it was called the Veterinary Service Institute operating as Alamo Dog & Cat Hospital for large and small animals. It was a full service hospital also offering ambulance service and all grooming and pet needs. After Dr. U.E. Marney, Drs. 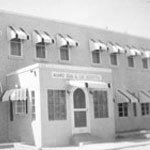 Parker, Brown, and Culpepper operated the practice until 1971, at which time Dr. Eric Lange and Dr. Ronald Orrell took over the practice. Dr. Mark E. LaBrie has owned and operated the hospital since 1984. The hospital remained in the same location since it was founded until May 2004 when a new facility was built behind the old building. 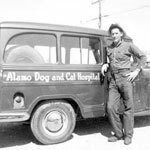 For the complete story, click on Texas Veterinarian, a magazine published by Texas Veterinary Medical Association, to view the four page story about the history of Alamo Dog & Cat Hospital. Mark E. LaBrie is a Past-President of the Bexar County Veterinary Medical Association. The goal of Alamo Dog & Cat Hospital is to provide the very best veterinary care at a fair and affordable price to our clients. Click here for an interactive map of our location. From the North: Exit I-35 S. at Southcross. Take a left on to Southcross and go east, and then take a right onto Pleasanton Road and head south about 1 1/2 blocks. From the East: Take Hwy 90 W./I-10 W to I-35 S. Exit I-35 S. at Southcross. Take a left on to Southcross, and then take a right onto Pleasanton Road. From the West: Take Hwy 90 E. to I-35 S. Exit I-35 S. at Southcross. Take a left on to Southcross, and then take a right onto Pleasanton Road.